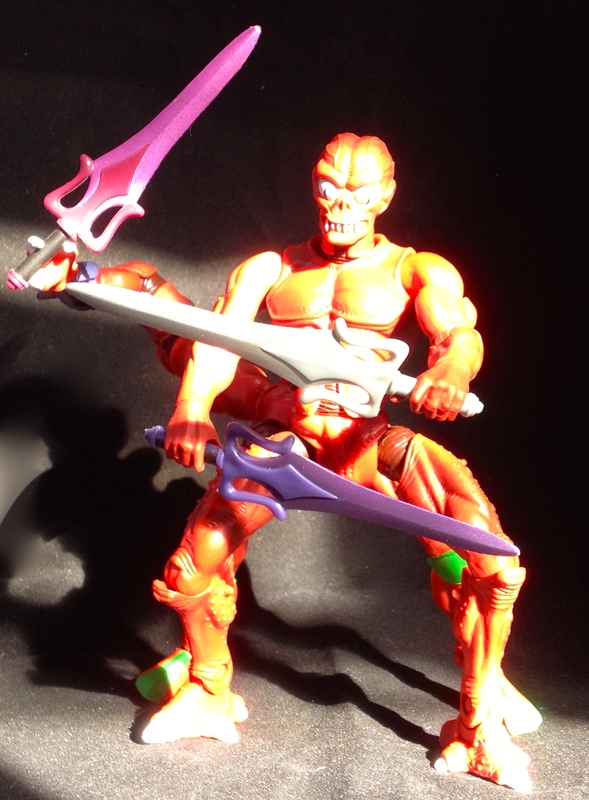 Growing up, the SpartanNerd and his brothers had maybe 85% of Masters of the universe stuff. 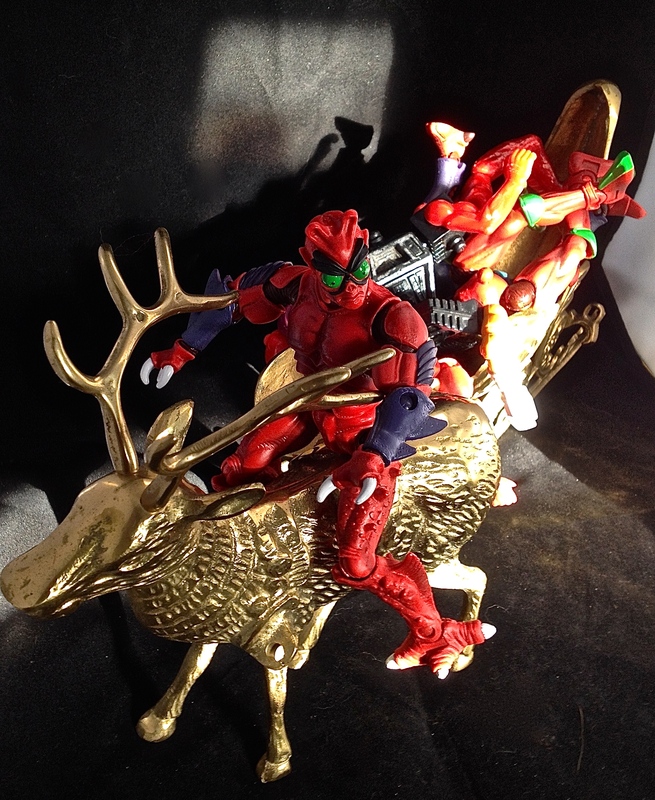 We had most of the figures, most of the vehicles and accessories, and most of the playsets. A few items really stood out, however…Modulock was one of those items. 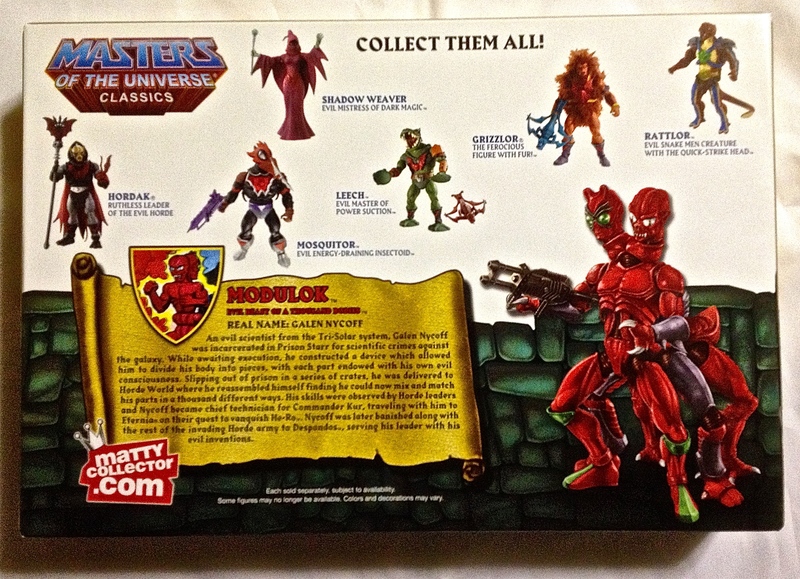 I specifically owned Multi-Bot, and the combinations you could make with the two of them seemed endless. 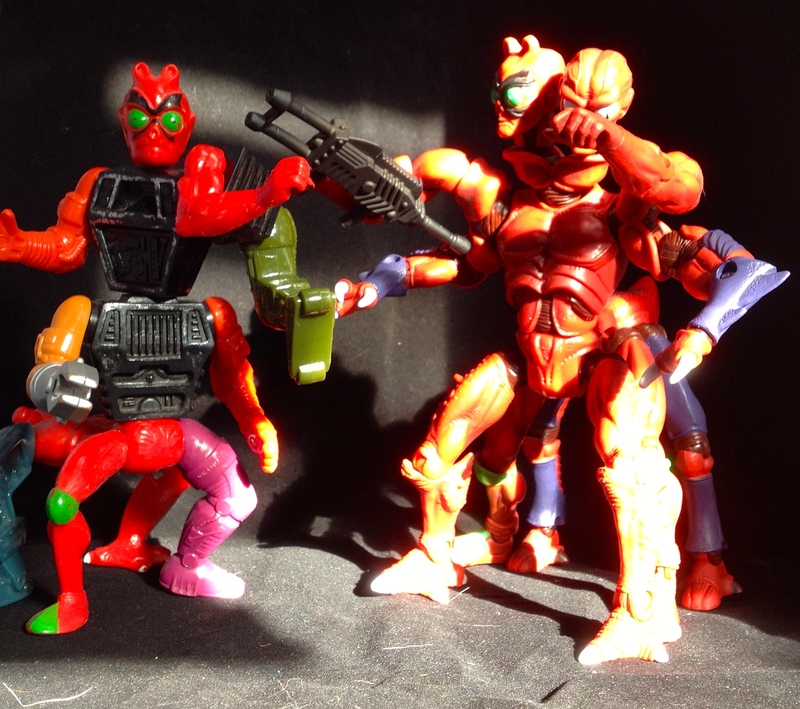 Modulok and Multi-Bot both scratch that “lego-itch” but in a cool action figure kind of way. Modulok came in the brown shipper. Notable only because it is brown instead of white. The actual box is painted and photo-shopped, not photographed. 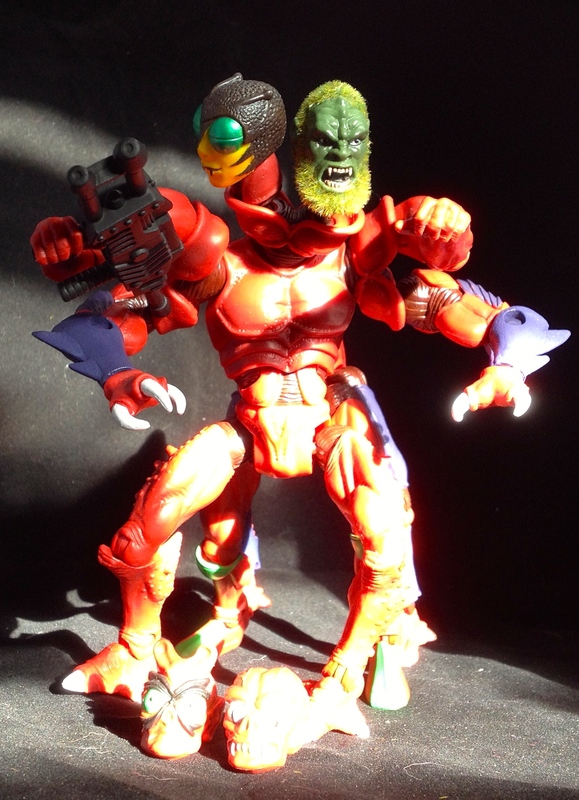 Th front features a conspicuous picture of Modulok in his suggested default pose, as well as many other suggestions. (You can make tons more, however) The back of the box gives us a new bio for “Gaelen Nycoff,” and shows off other Horde members. 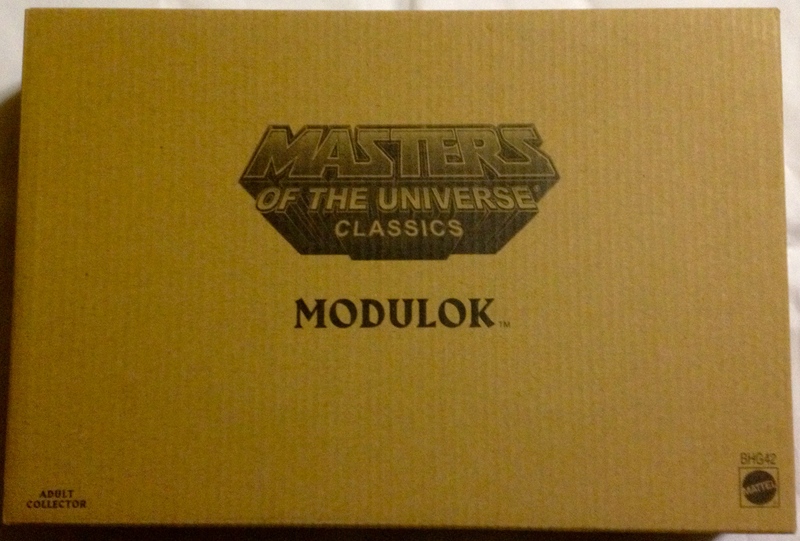 I am keeping this box to store Modulok’s pieces, rather than feeding Oscar the Grouch. 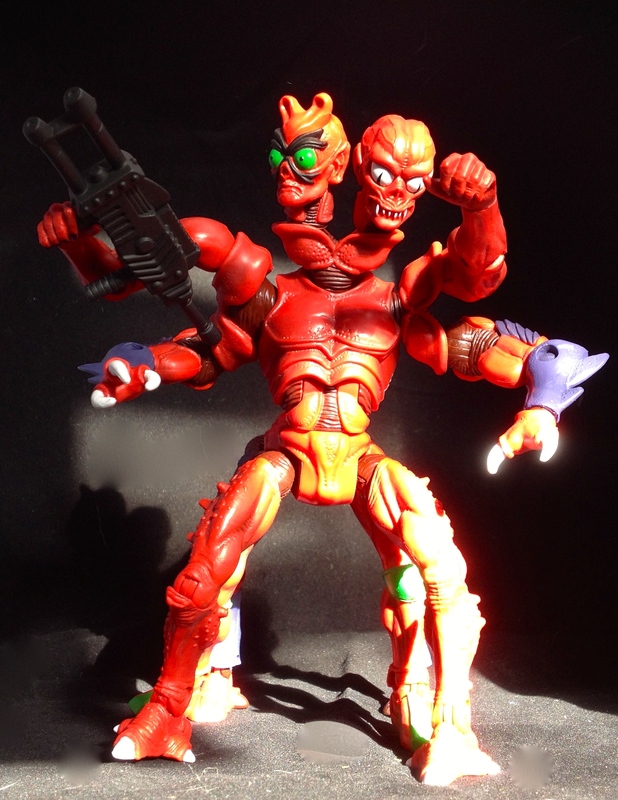 Taking the product out, you can see Modulok with his monster head, human arms, and human feet. He reminds me of “Meat” from Mortal Kombat. Though if you look close, rather than being bare muscle, he is more crustacean like. 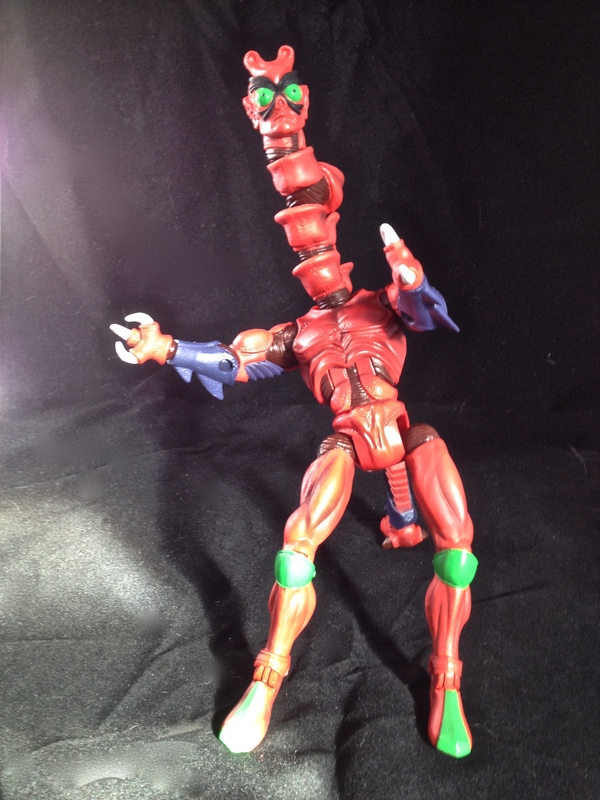 And then you can see that he comes with (top to bottom) two tails, three double sockets, one middle piece, two monster arms, two blasters, and four extra legs, with varying colors and claws. Oh yes. And another head. I prefer to get as much of Modulok together as I can. This leaves behind only an extra tail. But I have already spent about two hours, me and my children, making different arrangements. Here are some below. Here is a list, left to right, top then bottom. we could make one product into two figures if they included another torso. But they didn’t. You can stack those double sockets into a chain to make long necks, joints, tails, or whatever. I really like making a scorpion style tail. On the left, you can really see that. 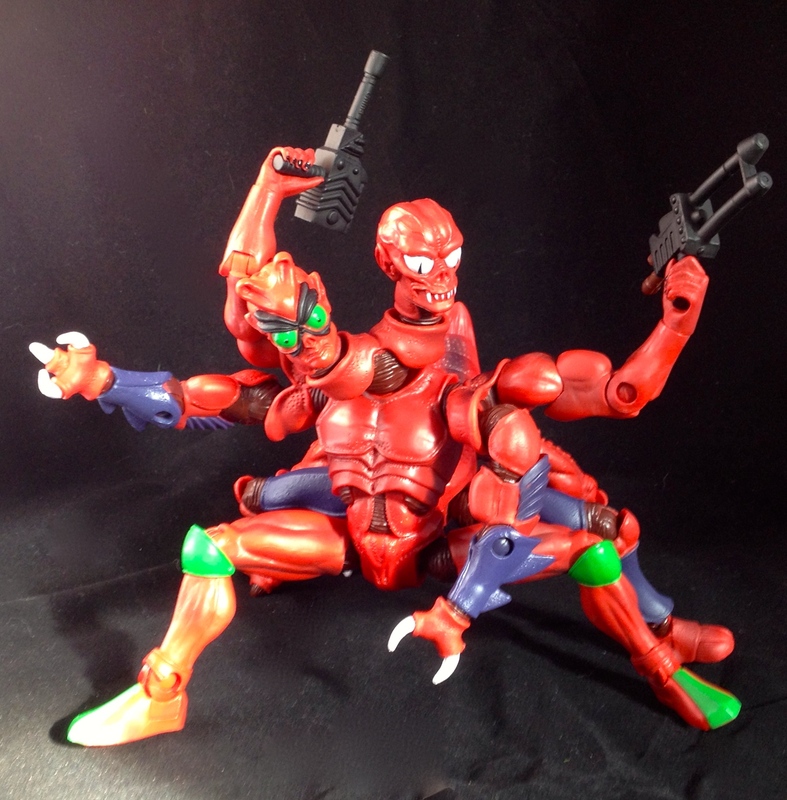 On the right he is showing that he can hold all three power swords that i own! Modulok’s heads are the only part that don’t have pegs besides the torso. The heads have the same socket that all of the other figures have. Here you see I replaced the bug-eyed head with another bug-eyed head, and the monster head with another monster head. No doubt, Modulok is one impressive figure. 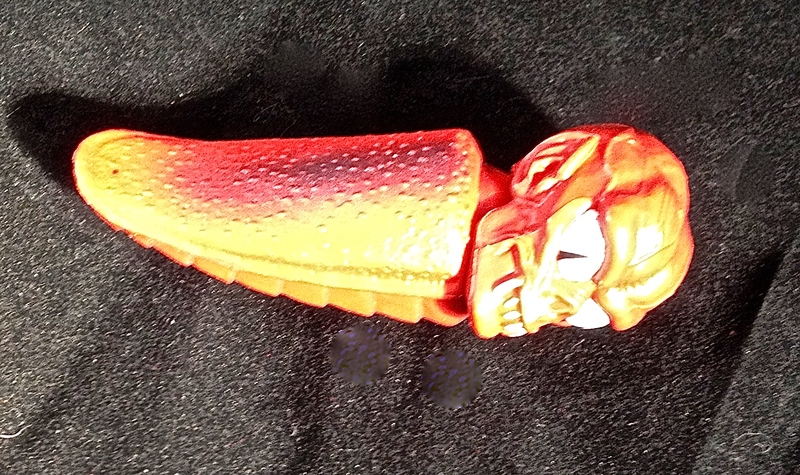 I will show you the remnants of my vintage toy…it is technically Megabeast, the combination of Modulok and Multi-Bot. And then we have a place to reference first. 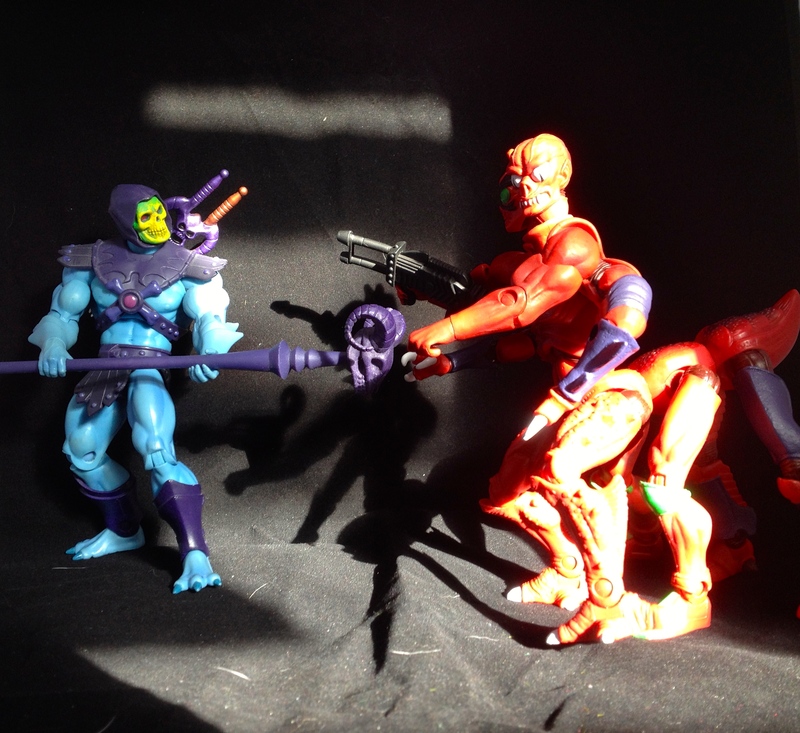 Every one of MOTUC Modulok’s joints is articulated the same way the other standard figures in the line are. Very impressive. You can see in the above picture that the old version had arms and legs that only moved at the shoulder, and then only up and down. 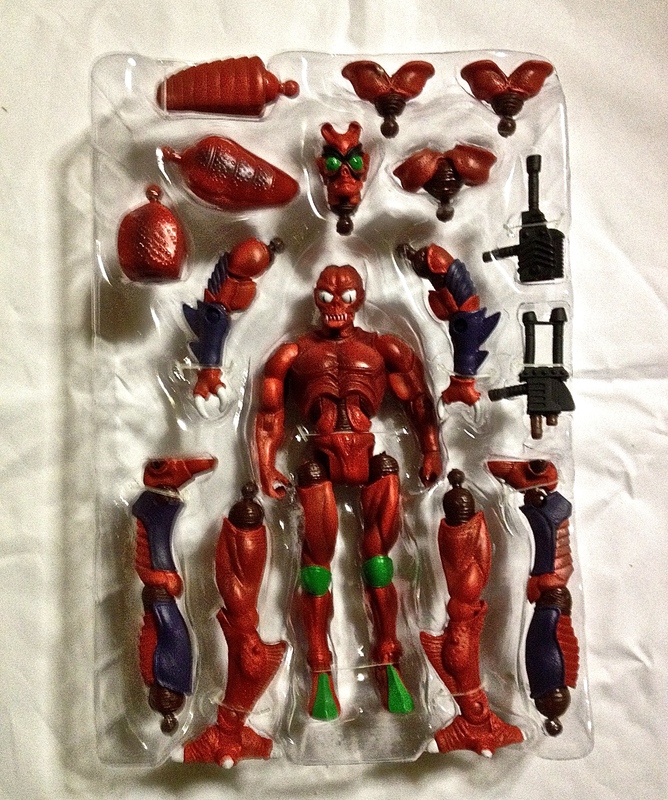 And then add in the ab crunch, which no vintage figure had as well. 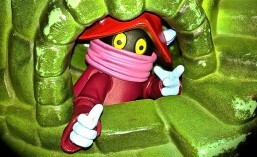 Modulok is “finger food.” You can’t really put him down. You can make tons of things. He is straight out fun, and that is a 5/5. But there has to be an asterisk. You only get one torso. And the torso doesn’t separate from the waist. Bummer. 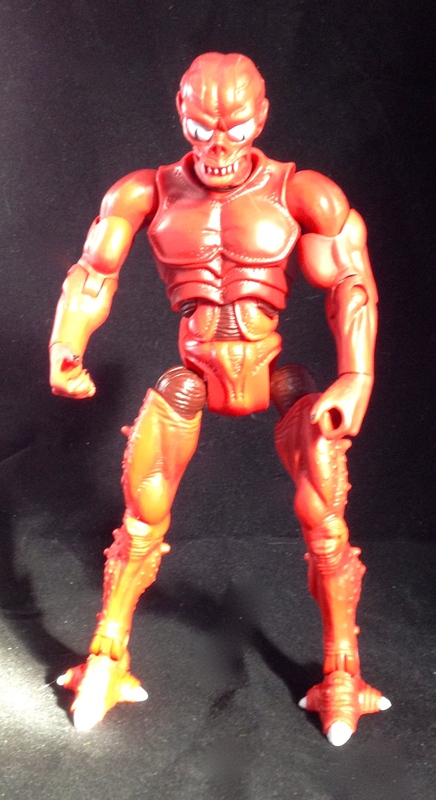 And one more thing…maybe to accommodate the parts swapping feature…he feels a tad more rubbery than the other figures. Not really a mark against, but it is worth mentioning. Still, it is amazing that we even got a Modulok. Considering how much this tooling must have cost, and it doesn’t appear that they skimped on the paint either. 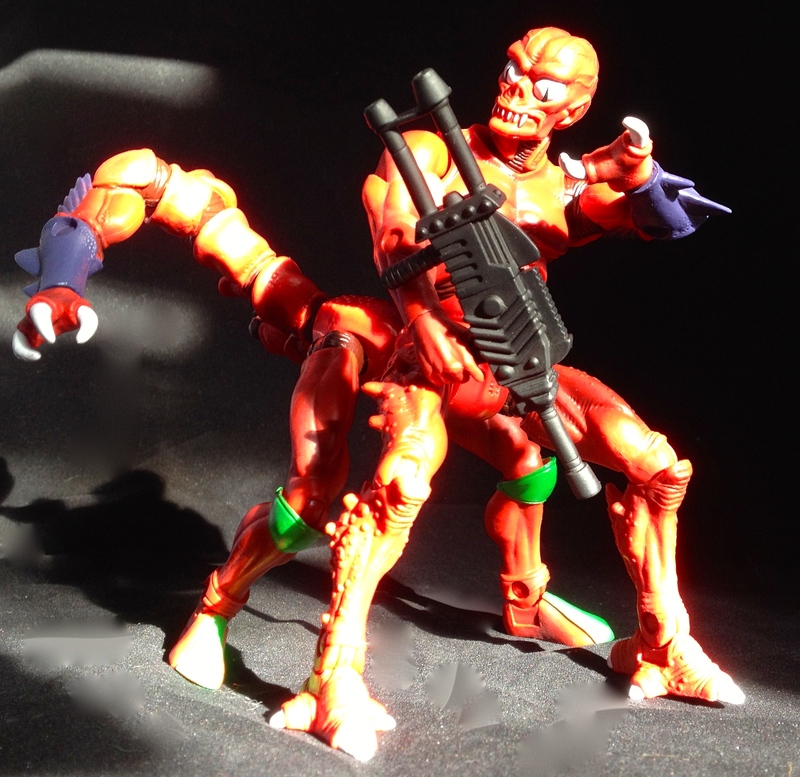 So, the SpartanNerd gives Modulok a 5/5! Do you agree? Let me know in the comments. I am gonna leave you with a few more fun pictures. 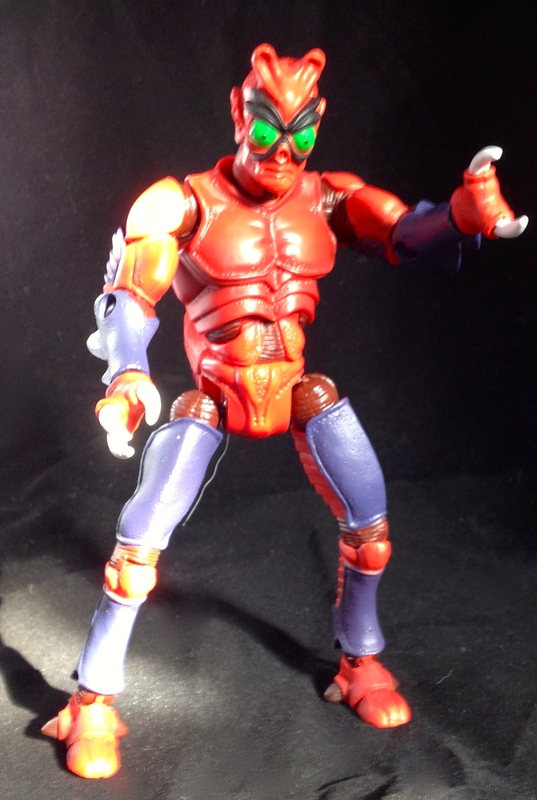 I need another Bug-Eyed head….